This page covers Army Generals' (Rifles, Armor & Artillery, Engineering & Signals and Rear & Techinal Services) Victory Parade uniforms. The standard M1945 "Victory Parade" Generals uniform for a Rifles Major General. The uniform is made of high quality "wave green" (sea green) castor wool and has red piping on the collar, cuffs, front seam and rear vents. It has gold embroidery in the generals' laurel leaf pattern. The hat and trousers are made of the same fabric. The hat has a red band with red piping above and below the band and around the crown. There is a lot of high quality gold laurel leaf embroidery with gold sequins on the band. The hat peak is pressed card and not leather and has no embroidery. The round hat badge has a red enamel centre signifying infantry (combined arms) generals. The trousers have red edge-seam piping and twin wide red stripes. This uniform has the gold parade belt which was introduced in September of 1945 and the M1940 a generals' parade dagger. Before that, the silver M1943 parade belt had been worn. 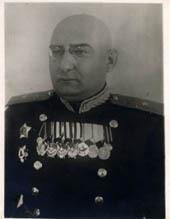 Note that his three rows of orders and medals are worn between the button rows, a practice started in late 1945. This way no buttons had to be removed from the left row. 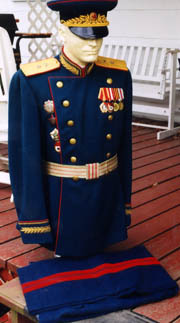 This particular uniform was tailored in Odessa. 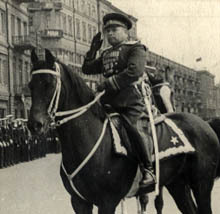 A photo of Colonel General Kryzer, awarded the Hero of the Soviet Union (HSU) for the defence of Moscow, seated in his M1945 parade uniform. Kryzer wears breeches with tall leather boots. He has one long row of medals which has necessitated the removal of the 2nd button from the left side of the tunic. His HSU gold star is worn in the proper place high on the left breast. Photo of a Lieutenant-General and HSU. 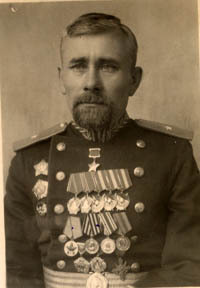 His three rows of medals, including three Polish awards, are worn between the rows of buttons and his HSU gold star is on the upper left breast. 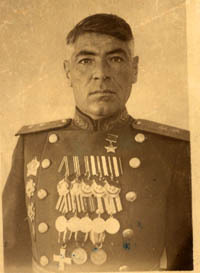 This Major-General and HSU wears all of his medals in an very central position. His HSU gold star is centered directly below his collar. Note his Mongolian orders. He wears the M1945 gold parade belt. It is very unusual to see Soviet officers, even generals, with a beard. 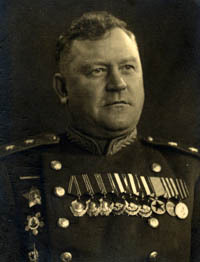 Photo of a Lieutenant-General wearing wound stripes (barely visible as a horizontal line above the screwback orders on his right breast. Note the 2nd button, left row missing to make room for the medals. This general in his M1945 parade uniform has a M1940 generals' sabre on his left hip. 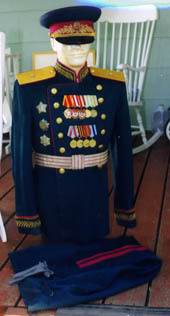 A Major-General of Artillery M1945 parade uniform. The tunic and trousers are identical to those worn by infantry generals. The black cap band is what denotes him as a tank or artillery general. Shoulder boards are red piped like infantry generals. Tank generals did not wear shoulder board insignia, while artillery generals did. The embroidered crossed canons are just visible above the single silver star. He wears the silver M1943 parade belt (with red stripes to match uniform piping - as worn by infantry, artillery and tank generals). 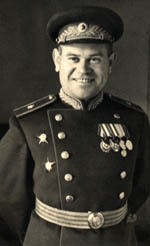 The medals are worn in the pre-September 1945 style (with removed second button on the left side). 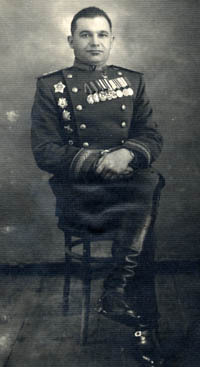 Although barely visible in the photo, this artillery major-general had metal crossed canon insignia on his boards instead of the embroidered version. 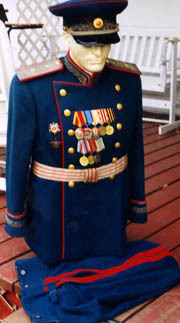 A Major-General of Technical Troops M1945 "Victory Parade" uniform. Technical troops generals include engineering, signals and technical services. The key difference on M1945 generals parade uniforms between the technical and combat troops is the magenta piping on the uniform (tunic collar, cuffs, front seam and rear vents; shoulder board piping; hat band and piping; and trouser piping and stripes) and belt for technical generals. Note the magenta stripes on the silver M1943 style parade belt. This Engineering Major-General wears the M1945 gold parade belt with his M1945 "Victory Parade" uniform. The angle of the light in the photo highlights the magenta piping on the shoulder boards. 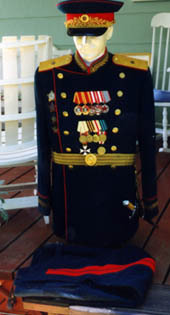 A Major-General of the Administrative Service's M1945 parade uniform. Administrative Generals had duties in administration, legal, and medical. The uniform resembles that of a rifles general with two main exceptions. The major variation of course here is the silver embroidery on the hat and tunic. Secondly, the hat has a dark green band. There were two types of boards used on these uniforms - narrow and wide. Wide was for generals who rose through the ranks. Narrow was for Generals appointed in time of war. This was originally just done for naval administrative units but was later done in the Red Army.